Growing trade uncertainty, weak economic indicators and a series of domestic political challenges have pushed major stock market indexes in China, South Korea, Turkey, Italy, Germany and Mexico into bear market territory. More could be on the way as growth fears multiply — key benchmarks in Spain, France and Russia are all less than 5 percent away from bear market territory. Recent signs have suggested the slowing growth could be affecting U.S. equities. The Dow Jones Industrial Average, S&P 500 and Nasdaq Composite are all sitting in correction territory for the first time since March 2016. Several major stock indexes are at or nearing bear market territory, adding to mounting fears of slowing global growth. Over the past few months, investors have retreated from stocks around the globe, pushing the iShares MSCI ACWI ETF — which invests in an index that tracks global markets excluding the U.S. — to its lowest level since May 2017. And, just last week, that group fell into into a bear market, defined as a fall of at least 20 percent from its recent peak. Growing trade uncertainty, weak economic indicators and a series of domestic political challenges have pushed major stock market indexes in China, South Korea, Turkey, Italy, Germany and Mexico into bear market territory. And more could be on the way as growth fears multiply. Key benchmarks in Spain, France and Russia are all less than 5 percent away from bear market territory. The escalating trade tensions between the U.S. and China pushed the Shanghai Composite Index, one of China's leading stock indexes, into a bear market in June. Hong Kong's Hang Seng Index followed closely behind, breaching that level in September, and South Korea's KOSPI did so in October. And, last week, fresh evidence pointed to a further slowdown in China, the world's second-largest economy. Retail sales grew at the slowest pace in 15 years in November, while industrial production expanded at the slowest clip in nearly three years. That data pushed major Asian market indexes further into bear market territory, and the Shanghai Composite has now lost a quarter of its value since its peak in late January. Italy and Germany, meanwhile, have been at the forefront of the economic slowdown in Europe. The Italian FTSE MIB has plunged 24 percent from its recent high in late May, while Germany's DAX has fallen nearly 21 percent from its January closing high — entering bear market territory earlier this month. Investors have pulled away from Italian stocks largely due to domestic concerns. Italy's government has insisted on sticking to its lofty spending ambitions for 2019, which include a deficit equal to 2.4 percent of the country's annual output. This prompted an unprecedented rebuke from the European Union, which rejected the draft last month and threatened sanctions. Italy's prime minister has made concessions over the past few weeks but distance still remains between country leaders and the European Commission. Shares in the country's banking sector have lost more than 36 percent of their value since a 52-week high in late April. Germany's DAX, on the other hand, has been hit especially hard by global trade friction. The index, which tracks 30 major companies in the German economy, features several firms which generate a significant portion of revenue from around the world, leaving them exposed to trade uncertainty. The big three German automakers — Daimler, Volkswagen and BMW — have all dropped more than 20 percent from their late January highs. Daimler, the parent company of Mercedes-Benz, has been the worst performer, down 38 percent since its peak. And, during the past four months, both Daimler and BMW have issued profit warnings, blaming the prospect of new tariffs and new emissions tests for weakening demand and declines in car production. According to brokerage Bernstein, German carmakers made at least 40 percent of their profits last year in China. Tariff fears have plagued auto suppliers in Germany as well. Continental, the world's second-largest car parts maker, has cut its 2018 revenue outlook twice this year, pointing to weaker car sales in Europe and China. The German auto industry accounts for roughly 8 percent of the country's GDP, and these mounting corporate profit warnings have put added pressure on a German economy that has been reeling. German GDP fell in the third quarter, its first contraction since 2015, partly driven by the aforementioned emissions testing. The decline is also symptomatic of a string of warning signs over the past two months. Retail sales declined for the fourth consecutive month in October. Business confidence slipped again in December for the fourth consecutive month, hitting its lowest level since 2016. Purchasing Managers Index for manufacturing and services hit a four-year low in November (the monthly index has dropped eight times in 2018). The German government has lowered its 2018 GDP outlook from 2.3 percent in April to 1.6 percent as of last week. That's down from 2.2 percent growth last year. Those declining economic fundamentals could prove even more troubling amid uncertainty around Chancellor Angela Merkel's succession. Weak data in other countries, coupled with persistent worries over Britain's exit from the European Union, has further fanned worries about growth and made investors consider which European market could be the next to fall to bear market levels. One possible contender is France, as its benchmark CAC 40 Index has dropped more than 15 percent from its May highs, pulling it less than 5 percent from bear market territory. Similar to their German peers, French automakers Peugeot and Renault have fallen mightily in 2018 as investors dump a sector vulnerable to higher tariffs. Renault is a whopping 50 percent off of its 52-week high. French tiremaker Michelin has also been under pressure after warning of declining sales in Europe and China during the second half of the year. And new evidence has sparked concerns that the malaise could spread to the broader French economy. In November, the French private sector contracted for the first time since early 2016, hampered by disruption to business caused by weeks of anti-fuel-tax demonstrations in Paris. Citing those protests and their effect on supply chains, the Bank of France cut its growth estimate for the current quarter from 0.4 percent to 0.2 percent just last week. Before the protests, economists had expected French growth to pick up in the second half of the year as tax cuts aimed at boosting consumer spending took effect. Recent economic data out of the wider euro zone has been underwhelming as well. The IHS Markit Purchasing Managers Index, a key European measure of manufacturing, hit a 49-month low on Friday. That came one day after the European Central Bank trimmed its GDP forecast for 2018 to 1.9 percent, down from 2.0 percent in September. Next year's forecast was also revised downward, back to 1.7 percent from an earlier forecast of 1.8 percent. And, in his speech to reporters last Thursday, ECB Mario Draghi warned that recent European economic data suggested slower growth momentum, adding that the balance of risk was "moving to the downside." The ECB announced the same day it would formally end its multitrillion bond-buying program at the end of the month — the quantitative easing program designed to hold down interest rates and stimulate lending. But Draghi nonetheless confirmed the ECB would maintain protracted stimulus amid the euro zone's recent unexpected struggles. That weak growth has even attracted the attention of the White House's chief economic adviser, Kevin Hassett, who told CNBC last week that Europe was one of the areas where the administration's 2019 economic outlook has "changed a lot." "The European economy is clearing slowly," Hassett said. "[It's] slowing because capital spending is on hold as people wait to see what happens with Brexit ... there's a lot of financial distress in Italy, and, of course, Europe exports a lot to China, which itself, I think, is suffering a severe slowdown right now. The global economic outlook is a bit lower than we had last year." The economic headwinds and downbeat sentiment have forced investors to consider to what extent those recent data points could spell more pain ahead for U.S. equities. Despite the recent market turmoil, the major U.S. indexes are still outperforming their global peers. The S&P 500 is off more than 12 percent from its late September record, while the Dow Jones Industrial Average has dropped more than 11 percent from its peak in early October. 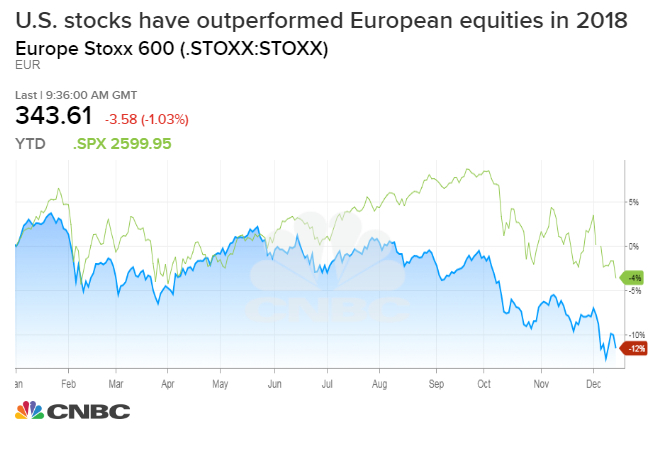 By comparison, the pan-European Stoxx 600 index has fallen more than 15 percent from its 52-week high. But recent signs have suggested the slowing growth could be catching up with U.S. markets. On Monday, the Dow finished at its lowest levels since late March and the S&P 500 posted its lowest close since October 2017. Weak economic data from China has drowned out hopes of progress in ongoing trade talks. The Dow, S&P 500 and Nasdaq Composite are all sitting in correction territory for the first time since March 2016. "We've been cautious for quite a while ... and we're assuming that we're in the midst of a new cyclical bear market," Doug Ramsey, chief investment officer at The Leuthold Group, told CNBC. "If you look at declines in foreign stocks, you don't even have to make that forecast. It's there, and it's happened. The Dow and the S&P 500 are always the ones that put on this show of superficial strength right up until the very end, and I think they'll be the last to crack into next year." Weakness in key sectors has also weighed on investor confidence. Financials fell into a bear market on Friday, joining materials and energy stocks. The decline was driven by a fall in bank shares amid worries about slowing global economic growth. And other economically sensitive sectors, including housing, transport and industrial stocks, are all down by double digits in 2018. DoubleLine Capital CEO Jeffrey Gundlach sees more pain ahead, saying that he "absolutely" believes the S&P 500 will go below the lows that the index hit early in 2018 amid these economic warning signs. "I'm pretty sure this is a bear market," Gundlach told Scott Wapner on CNBC's "Halftime Report" on Monday. "We've had pretty much all of the variables which characterize a bear market." Gundlach specifically noted that 80 percent of the iShares MSCI World Index — which tracks global markets across the world including the U.S. — is currently in a "death cross". Wall Street traditionally defines a "death cross" when a stock or index's average price over the last 50 days drops below the 200-day moving average, a sign of negative momentum and possible change in trend. "It's a pretty widespread and coordinated set of weaknesses," Gundlach added. Several investors agree that U.S. equities will continue to be vulnerable heading into next year, but not all are convinced major U.S. indexes will follow in lockstep with these other world markets. Jeffrey Saut, chief investment strategist at Raymond James, and Anastasia Amoroso, head of investment strategy at J.P. Morgan Private Bank, both pointed to high projections for corporate earnings growth next year as an encouraging sign. Others are less convinced of a steep U.S. economic contraction. "The fact that Germany is down 20 percent, China is down 20 percent, and now the U.S. has joined the downturn ... that's what suggests to us that the global economy is in recession or on the verge of recession," Bruce Bittles, Baird & Co. chief investment strategist, told CNBC last week. "[But] the U.S., we don't think, is going to enter recession. We think there's going to be a slowdown here ... that's going to influence corporate profits to a certain extent." Bittles added that volatility would likely remain high going into 2019, and "persistent downside momentum" remained a key obstacle to a turnaround. Despite pockets of optimism, continued weak economic signals abroad, coupled with ongoing trade uncertainty and depressed investor confidence are dampening prospects for a rebound in U.S. stocks in 2019. And, according to a new report from the world's largest international financial organization, the latest wave of heavy selling in financial markets is, in fact, a sign of things to come. The Bank for International Settlements, an umbrella group for the world's central banks, warned over the weekend of another threat that could spark a further sell-off — the normalization of monetary policy. The next fund for investors to watch could be the iShares MSCI World Index, down 15 percent from its recent high. If that slide continues, it could be the clearest sign yet of a global economic downturn.